Autobiography of UK anarchist and print worker Albert Meltzer. Albert Meltzer (1920–1996) was involved actively in class struggles since the age of 15; exceptional for his generation in having been a convinced anarchist from the start, without any family background in such activity. A lively, witty account of sixty years in anarchist activism, and a unique recounting of many struggles otherwise distorted or unrecorded, including the history of the contemporary development of anarchism in Britain and other countries where he was involved, notably Spain. His story tells of many struggles, including for the first time, the Anglo-Spanish cooperation in the postwar anti-Franco resistance and provides interesting sidelights on, amongst others, the printers' and miners' strikes, fighting Blackshirts and the battle of Cable Street, the so-called Angry Brigade activities, the Anarchist Black Cross, the Cairo Mutiny and wartime German anti-Nazi resistance, the New Left of the 60s, the rise of squatting—and through individuals as varied as Kenyata, Emma Goldman, George Orwell, Guy Aldred, and Frank Ridley—all of which have crowded out not only his story, but his life too. Starting this. I combined the Foreword and Introduction, will be combining the two appendixes and not adding the pictures section in order to fit it. It has 30 chapters though. So with the F & I and Appendix that will be 32 sections and you can only have 31 child pages, am I right? What should I do? Hi, you can have an infinite number of child pages. The way they're organised, they sort by weight first, then alphabetical. So things like chapter 1, chapter 2, etc will automatically go in the correct order so they can all be the same weight. Chapter 10, 11, 12 etc will need to be made one heavier, otherwise they will follow chapter 1 (unless you start off using two digits: chapter 01, 02 etc). Hope this helps make things a bit easier for you! By the way, I loved this book when I read it back in maybe 2002 or 3. It was a big influence on those of us who became the libcom group at the time. Ah, makes sense about the child pages. Thanks. And yeah, I wouldn't mind tracking down a hard copy of this. From what I've read as I've added, it looks pretty good. It was a big influence on those of us who became the libcom group at the time. Oh, by the way, how so? Just curious. I plan to read this and was wondering if there's specific things that ya'll got from it that I should pay particular attention to. Thanks Juan, that's really great. That was a really big piece of work! In terms of influence, we were pretty young at the time and new to the whole anarchist scene. Basically it influenced us in moving towards class struggle anarchism and away from individualism/liberalism/pacifism/mindless activism. Coming from the perspective of someone who already has those ideas, it is probably just interesting from the point of view of his life and recollections of stuff he was involved in. One thing which jumped out at me reading the book was that nowhere does it explain the title. Battlescarred told me that the name of the book comes from him applying for a job to paint a pub sign which had a golden angel on it, but he didn't get the job. He does explain it, can't remember quite where though. Basically, he's comparing his life to that of a sign painter who paints red lions everywhere, then gets a job painting a sign of golden angels. He cannot, all the time he tries those red lions keep coming through. Albert tried to "retire" from the anarchist movement several times during his life. 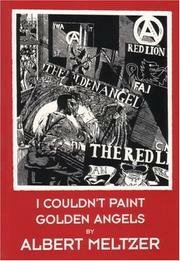 He wanted to paint golden angels, as a metaphor for doing something else with his life. Like many of us here who have tried, he failed, because the "red lion of anarchy" kept on coming through. MH is correct, there was supposed to be an explanation of the title, but that, by mistake, wasn't printed. I think the story referred to was originally by Heine. Some very poor things in here about Indigenous Australians in chapter 27. He makes the strange claim that the 'new generation' of Aboriginal people are into nationalism, which is not and never has been the case. There is the also the insulting suggestion that they are all jobless alcoholics, aside from those that have moved into 'modern times' and are 'equal to anyone'. Bizarre that he maintains these bigotries even though he recognises that the British committed genocide. He clearly never looked at this issue in depth or with any kind of sensitivity or sympathy. Not wanting to distract from the rest of the book though, it is pretty interesting, it's just that this section in particular is very bad.